Story: I have yet to meet an Indian who does not like Pani Puri aka Gol Gappe - For me - "Sirf Naam hi Kaafi hai!" Mouth watering taste of Pani Puri never gets old! Growing up - favorite menu for my Bday party was - Bhel, Pani Puri and home-made Pizza with Amul Cheese. 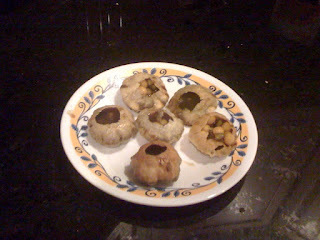 I decided to make Pani Puri for this year's bday party - and knew it would be a big hit.. But this year's Pani Puri was special for a different reason - We had HOME MADE PURIs!!! that too Suji/Rava puris and not maida puris.. Crispy, crunchy fresh puris.. and the credit goes to Madhu-ben who helps me in the kitchen and has a ton of specialties. This is the first time she made Puris at home and they were just fabulous.. especially her technique of flattening and heating the puri in a Tortilla maker is very innovative. Here's to an Indian's eternal love for Pani Puri and to Madhu-ben's innovative puri recipe! If you are planning to make puris at home, thoroughly mix rava and soda and keep it covered for 2 hours. We will cover the rest of the puri recipe after we make tikha pani..
Now on to Tikha Pani - Blend mint leaves, green chillies, cumin seeds, cloves, pepper and black salt into a paste.. taste and add salt as needed. In another bowl - mix water with tamarind pulp. 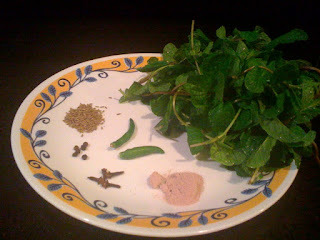 Add the mint chutney to this mixture. Keep this in the fridge overnight. Next day, filter this mixture to get chatpata tikha pani! You can reuse the chutney residue for another round of tikha Pani..
For Mitha (sweet) Pani: I just get store bought Tamarind-date chutney, and add cumin powder, black salt and water as needed. Now on to the filling - Soak white chana and moong in water for 3-4 hours. Pressure cook both chana and moong with added salt, cumin powder (1tsp) and coriander powder (1 tsp). For potatoe filling - boil and mash the potatoes, then add salt, red chilli powder (1/2 tsp) and cumin powder (1 tsp) and mix well. If you have store bought puris - you are ready to assemble the Pani Puris - Take a Puri, make a hole in it, stuff with a tsp of the filling. Then add tikha pani and mitha pani as per your taste. Once the Puri is full of this spicy goodness.. take it all in!!! As mentioned earlier - Thoroughly mix rava and soda and keep it covered for 2 hours. Heat about 2 liters of oil for deep frying. Knead the dough again until it's soft.. Connect a Tortilla Maker to power and start heating.. once it is hot, add 4-5 balls of the dough (1 cm diameter) to the tortilla maker and press it once. Quickly open the tortilla maker and remove the puris - add to hot oil immediately for deep frying. The flat puris instantaneously puff into puris.. 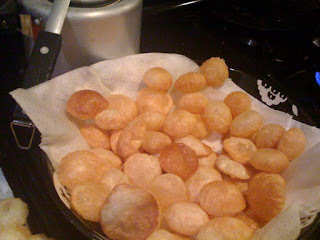 Deep fry the puris on slow-medium heat till golden brown.. remove and place on a paper napkin to dry. Do not increase the heat or remove puris before they change color. Puri's will go soggy if they are not fried for enough time.. if you increase the heat - you may burn the puris. Store cooled and dried puris in air tight containers. Wow - looks great! - Feel like eating it right now!!!! Me n mom are so psyched to make the homemade puris. If they turn out well, you guys are going to be invited for golgappe night.